← How to convert documents of Microsoft Office Excel to PBM? In this article, I will show you how to convert Excel to image, say xls to eps. 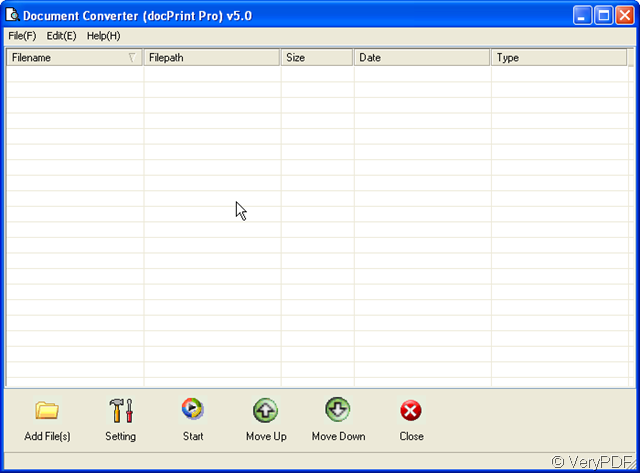 I do the conversion by an software named docPrint Pro which not only can be used as printer driver but also can be used as a file format converter. When you use it as a printer driver, it can help you save a lot of paper, ink and precious time. ,Meanwhile, when you use it as file formats converter, it can do more than you can image. It nearly can convert all the printable file to image file formats and PDF files. Experiencing it one time, you will know how wonderful this software is! When you download it successfully, you will find there is a icon which looks like a eye gauge appears on your desktop. double click it then you will enter its interface. Second, add the Excel file to docPrint Pro. Simply dragging the file from its folder to the blanks will be ok.
Third, set the output file format by clicking the button “setting” then go to base setting label to choose eps as output format. Take converting xls to eps for example. Maybe the following picture can say better than I. Forth, set options for image file if you need. If you need to adjust the image color depth and image resolution, please go to “Save image mode” sub label. There are many choice for you to choose. Fifth, do the conversion from xls to eps by clicking the button “Start”. The bounced option box will remind to you choose a folder to save the converted eps file from Excel. A few seconds later, you will witness the success. 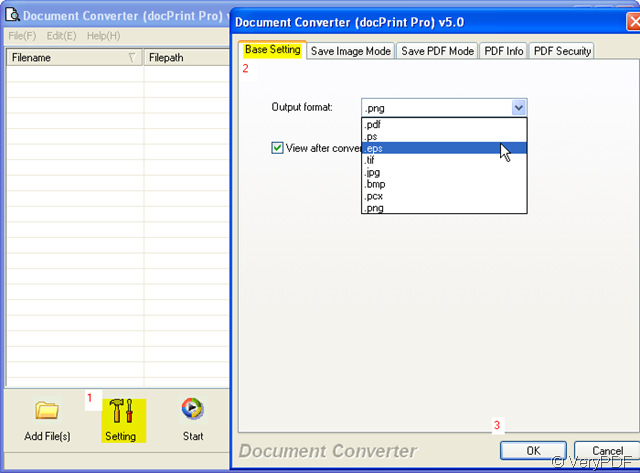 Converting Excel to image is successful by getting proof from the success that converting xls to eps by docPrint Pro. This way will be useful for those who need to insert Excel content as a picture to a document. docPrint Pro will be a good assistant for those who need to do the conversion from Excel to image everyday or need to print file daily. If you have further question about this software, you are welcome to email us at support@verypdf.com. Thanks for your reading and visiting in advanced. How to convert MS Office document of xls to png? How to convert MS Office document of xls to tif using Document Converter? 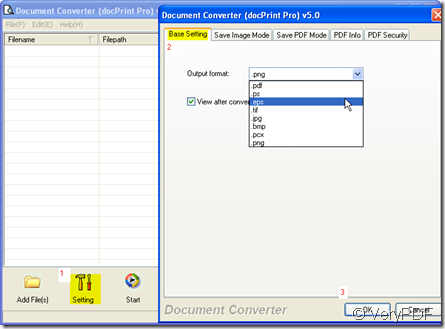 How to convert MS Office document of xls to pdf using Document Converter? If I want to put multiple pages on one sheet, and add a page number on each sheet, how can I do? This entry was posted in docPrint Pro and tagged docPrint Pro, Excel, Excel to image, xls to eps. Bookmark the permalink.